SEPT. 18 UPDATE: 13 Action News spoke with the man who recorded the video of the RTC bus driver flipping out. Tony McDew says he started recording as soon as he sat down on the bus and things were already escalating. "It was very scary," said McDew. "We realized this is something wrong, this is something very, very wrong. I had never seen anything like that before." McDew recorded for nine minutes and showed his family the outburst by the RTC driver. They told him to turn the video over to RTC. "Safety of the passengers and that's ultimately why I turned the tape in." McDew says he tried to calm the driver down as he was getting off at his stop. "When I get off, I even told the bus driver, you know, you need to calm down a little bit," said McDew. "Everything is gonna be OK, it's gonna be alright." ORIGINAL STORY: A local RTC bus driver is caught on camera flipping out on a passenger. 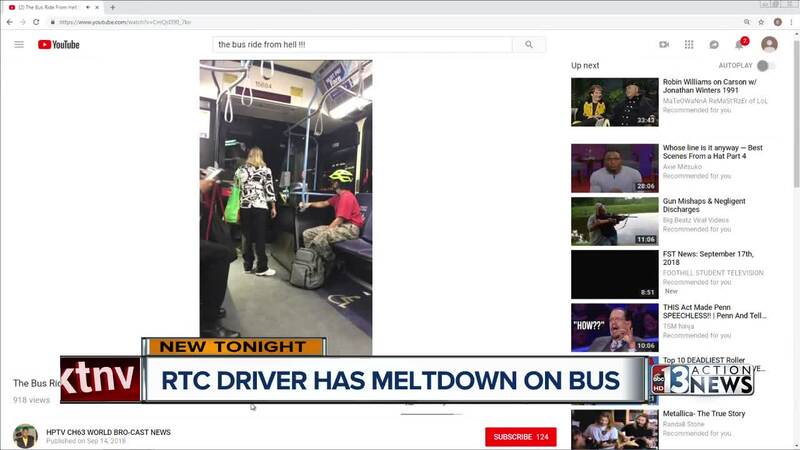 In the video, shot by YouTube user, HPTV CH63 WORLD BRO-CAST NEWS , you can hear the man swearing and screaming inside the bus. "Just get off the bus!" yelled the driver. "I'm having a stressful day. I don't want to hear any back talk. Let me just vent. I'm just venting, I'm seven minutes down. It's not alright. I'm gonna get written up for it, you don't do my job and don't know what you're about!" It's unclear what started the incident last Friday but the 9-minute long video shows the driver getting out of his seat a couple times to yell at the passenger. It appears everyone got off the bus safely. Other bus riders we spoke with were shocked to watch the video. "To my opinion, he shouldn't even be driving the bus because people have a right to speak and he's talking like he don't even want them to speak," said one man. "The actions of our driver in the recently recorded video is contrary to the training every driver receives. The driver in question has been taken out of active service while we further investigate the circumstances around this incident. Once the investigation is complete, NV Transportation will take appropriate disciplinary action. NV Transportation apologizes to any of our passengers who may have been affected by this incident."